Me and my mother stepped into Varanasi (an overnight train from Delhi - Shiv Ganga Express) on Sunday morning at 10am. A typical North Indian city greeted us with teeming crowds, the sweltering heat of April and auto and taxi walas aggressively trying to get you into their vehicles or go into the hotels being referred by them. After escaping all that, we took an auto to Godaulia Chowk which is within walking distance of the famous Kashi Vishwanath Temple. With a bit of searching, we booked a hotel nearby and after some rest, we ventured to the famous temple post lunch. The streets on the way to the temple (which was just 200 meters from our hotel) are bustling with shops attempting to sell all sorts of things - Clothes, religious goods and what not. The entrance to the temple is a narrow alley which is filled with more shops which you walk past and eventually after tight security checks (there is a strong police contingent), one reaches near the temple. Sunday afternoon was relatively less crowded; and we got a good darshan despite pundits and police folks (yes, they ‘re in the temple too) encouraging us to move faster. The Annapurna temple precedes the main Kashi Vishwanath temple and we were able to have darshan in the same. Thereafter, the main temple ticked off; we went to a series of other temples including the famous Sankat Mochan Hanuman Mandir and couple others all on the same path. We hired a rickshaw and went to each of those in one go and were back to our starting point in a couple of hours. In the evening, we strolled to the river Ganga which is right behind the temple; and enjoyed a scenic view of the flowing river. The river bank is divided into numerous Ghats and we had gone to the most famous one – Dashashwamedha Ghat. The immediate view was not so appealing as there was chaotic activity there with people bathing, washing clothes, boating all in the same murky water. At 7pm onwards (in summers and earlier in winters), Varanasi has a daily Aarti of the Ganges which is a beautiful sight to behold. 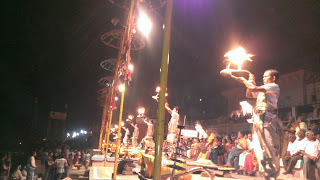 There are around 12 pundits who perform the Aarti and it is a great view. 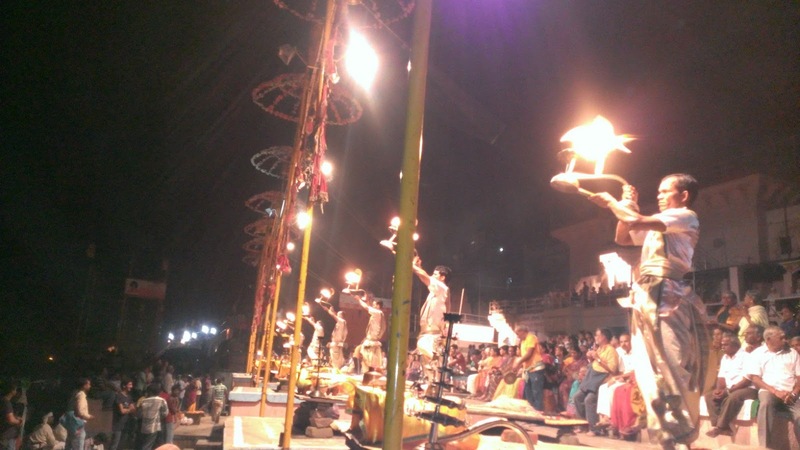 The aarti got a sizeable audience – hundreds of people watching from the steps on land and an equal number watching from boats on the river. Unfortunately, it started raining that day and the Aarti was curtailed but still a great sight. There is a Mangla Aarti (grand aarti) performed on the main shivling in the Kashi Vishwanath temple at 2.30 am (not sure if daily); and we decided to watch that. The token for the aarti was purchased during our afternoon sojourn to the temple and the next day (or same night); we got up (me bleary-eyed, my mother all enthusiastic) and made our way out. We took a token dip into the Ganges and ventured to the temple. There was sufficient crowd there and we all made our way into the temple to watch the aarti at 3am. Some of the folks didn’t get a good view, and did their best to hamper other’s views but that was to be expected. Aarti done, the temple opens for all public at 4am. We also got an Abhishek done from one of the many pundits there (who were doing the same for many people in batches); and eventually we made our way out of the temple at 5.30 am with the primary purpose of the trip accomplished. Thereafter, we hired a boat for Rs 200 and the fellow took us on a tour of the Ganges over a half an hour across all ghats. That is when we realized, that the famous Ganga snan (bath) is a much better accomplishment if done on the opposite river bank where it is much cleaner and many other folks specially took boats just for this purpose. After going to the hotel, and completing our sleep tll lunch time we still had some more time before our evening train. We chose to visit Sarnath – the place where Buddha gave his first sermon – a place around 15 kms from the temple and hired an auto for the same. Sarnath is a quaint, quiet, peaceful place with many Buddhist complexes and in fact Buddhist temples from different countries – Japanese, Chinese and so on. We visited the main temple but didn’t do much else due to the extreme heat. They also apparently run a zoo containing deers etc. Making our way back with a sense of satisfaction of a journey well accomplished, we caught our train in the evening and comfortably reached Delhi back the next morning by 8am.